November 2009 – I am. 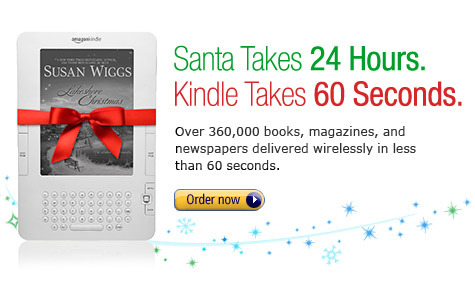 Just saw this ad on Amazon, and it struck me as funny because you can’t currently give Kindle books as gifts. Maybe soon, though? Tweak XML serialization/deserialization code for PlannerActionInstance; it may end up staying the way it is right now, but I have an idea which might make it a little nicer. Make sure the planner is returning PlannerActionInstance plans correctly. Finish making the GoTo action in the test app, and the rest of the test actions for a complete test. Make it pass the test, of course; make sure the action parameter inference stuff is working for parameterized PlannerActions like GoTo. Add XML serialization/deserialization code for DNA. Add an option to test the XML stuff to the test app (it has been tested, but not as a separate one of the options in the test app like the other things are). Beware the little “offers” which get you in-game perks on social games like the ones on Facebook and MySpace: most of them are scams. Continue reading You are being conned. Posted on November 3, 2009 November 3, 2009 Categories games, life, metaphysicsLeave a comment on You are being conned.